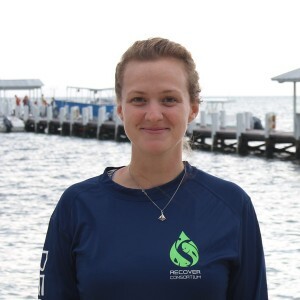 Georgina Cox is the post-doctoral fellow in Dr. Martin Grosell’s lab at the University of Miami’s Rosenstiel School of Marine and Atmospheric Science. Georgina received her Ph.D. from the Department of Zoology at the University of British Columbia, Canada. Her previous research has centered on understanding how fish hearts function using a variety of model species including hagfish, bony fish and elasmobranch species. Georgina’s research interests include integrating morphological analysis and innovative surgical techniques to understand how cardiovascular function responds to environmental and physiological stressors across taxa. By incorporating environmental data and comparative phylogenetic techniques Georgina aims to better understand selective pressures shaping cardiac morphology. As part of the RECOVER consortium, Georgina will be investigating the extent to which oil exposure affects cardiovascular function in pelagic and coastal fish species and how any observed cardiovascular changes impact survival.